New versions of Shazam Entertainment’s music-identification iPhone apps will restore VoiceOver accessibility for blind listeners. 23-year-old blind computer programmer Jason White said the inaccessible Shazam update interfered with VoiceOver on his iPod Touch even after switching away from the app, forcing him to completely close the app in order to restore VoiceOver accessibility. Peter Mahach, a 14-year-old blind iPhone user from Poland, said he used Shazam to identify the music in sound clips he enjoys collecting. Mahach said Shazam became inaccessible after a recent update, and he has missed the ability to use the app. Shazam Entertainment got bug reports from customers about audio management issues and crashes after the update. Rosenthal said the company moved fast to squash the bugs. Rosenthal said the VoiceOver fix will find its way into the paid-for Shazam Encore app on its next release, version 3.1.1, slated for the middle of November. He said the company values customer feedback. 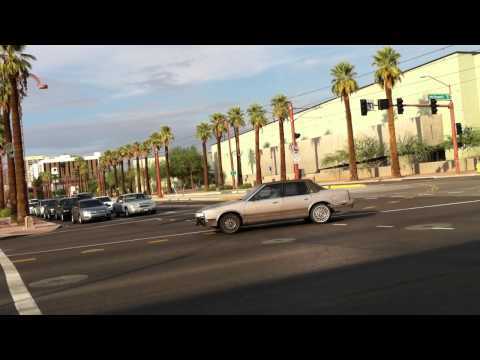 Watch this video of me crossing the busy intersection of Central Ave. and McDowell Road in Phoenix during the start of Friday-evening rush hour on Oct 22 as I made my way to the state fair. Kevin Chao demonstrates shopping in the iTunes App Store, posting to Twitter and sending a text message by entering text on the iPhone’s virtual on-screen keyboard using the touch typing method. Move to a field that requires typing and double tap to start editing. Positioning two fingers on the screen, twist them like a dial several times until you hear “Typing Mode” spoken. Flick up or down to toggle between “standard typing” and “touch typing” mode. Standard typing mode is the default, which requires double tapping or split tapping on everything in order to type. Touch typing, which is the mode being demonstrated in this podcast, allows automatic entry of text as soon as the finger is lifted. Touch typing mode can be faster for advanced users. Kevin Chao describes the way in which he uses his thumbs for touch typing on the iPhone’s virtual on-screen keyboard. 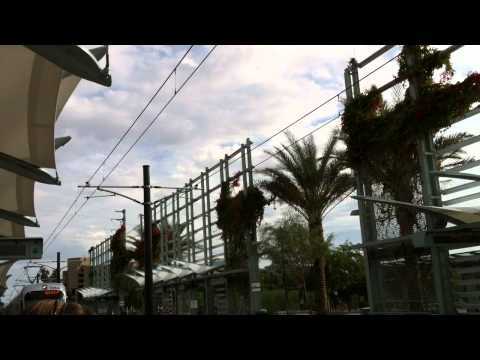 Check out this Oct. 22 video of me waiting for the light rail, going inside the car and finding an available seat. While this is done thousands of times each day by blind people all over the world, I doubt anyone has posted it as a YouTube video. As always, constructive feedback is welcome. Sendero Group offers a $5 iPhone app that aims to help blind people navigate outdoors using their iPhones. After installing the LookAround app, following these steps makes a great deal of information about the user’s surroundings immediately available. Orient the iPhone so that its screen is facing up toward the sky, the back is facing the ground and the power button is facing away from your body. Find Sendero GPS on the Home screen and double tap it to launch the app. 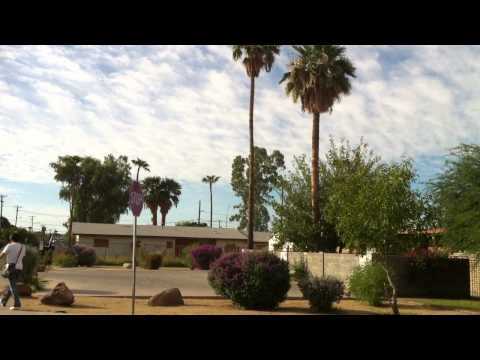 Shake the iPhone to hear the direction you are facing, your address, nearest cross street and closest point of interest. Apple CEO Steve Jobs said nothing in his Wednesday Back to the Mac event about continued VoiceOver accessibility of a new Mac App Store and OS X Lion operating system for the company’s blind customers. The new Mac App Store will offer iTunes-style one-click purchasing and installation of apps for the Macintosh computer operating system. Developers will be able to start submitting apps in November and the store’s grand opening is scheduled for Jan. 20. A member of Apple’s accessibility team declined to comment on the status of VoiceOver accessibility in the Mac App Store. “Since the Mac App Store is not available to the public and all features have not been announced, we can not comment on it any further,” said an unnamed member of Apple’s accessibility team. Apple also has no comment on continued integration of the VoiceOver screen reader on the company’s new OS X Lion operating system slated for a summer 2011 release. Blind computer science student and registered Apple iOS developer Kevin Chao said he’s not surprised at Apple’s silence on accessibility plans. It is anticipated that Apple will continue these accessibility commitments and innovations into its next operating system and far beyond. Kevin Chao demonstrates recording and trimming audio on the iPhone using the built-in Voice Memos app. Voice Memos is a handy utility for tasks ranging from basic voice-note taking to recording a demonstration of another iPhone app or feature right on the device without the need to use any additional equipment. I have implemented some useful feedback I received Tuesday morning, and this second take from the same street corner is the result. The iPhone was oriented in landscape mode and I took care to pan more slowly by moving my hips and shoulders while keeping my feet still. Additional feedback is now requested. The next video will be completely different. Jarrod Jicha demonstrates and provides basic instructions in the use of the Chinese Wouxun dual-band amateur radio handheld transceiver. This partially-accessible radio provides a level of limited voice output that surpasses anything currently available in other radios. Buddy Brannan has written a mini-manual describing battery installation, orientation and programming of the Wouxun radio from a blind user’s perspective. We thank Buddy and the Courage Center Handiham System for making this information available to the blind community. After listening to Jarrod’s demo, I am uncertain how I feel about this rig. On one hand, it represents a step forward in the accessibility of handheld amateur radio equipment. Alinco, Icom, Kenwood and Yaesu, the prominent manufacturers of amateur radio transceivers, do not include voice output in their handheld radios. On the other hand, in many respects, it provides little more accessibility than we have with radios that don’t include voice output. As I listened to the demo, I was struck by how voice output was provided in areas where we could learn to navigate without it, while important tasks like reading the frequency and selecting from menus remained silent. This radio reminds me of cell phones such as the LG enV3 or my wife’s Motorola I350 NexTel radio that don’t go far enough in providing fully-accessible voice output of all functions. One wonders about the level of thoughtful research and testing that didn’t go into the development of electronics featuring limited accessibility. The radio’s accessible battery indicator is a very nice touch. There are some concerning reports that the Wouxun radios aren’t as durable as those from the leading manufacturers, so be careful not to drop this rig. Despite the potential downfalls, I am excited about the availability of a radio that gives blind hams one more usable choice in a field that is sadly too limited.